The fully integrated and self-contained Marineland Eclipse Seamless Integrated Aquarium System is a great way for beginner hobbyists to start building an underwater environment. Perfectly sized for counters, desktops, shelves, stands, or other areas with limited space, the Eclipse System is easy to install, operate, and maintain. It’s perfect for raising fresh-water or marine fish at home, your office, or anywhere else you enjoy the calming influence of aquatic life. All filtration media is contained inside the top of the unit, allowing you to place the aquarium against a wall for maximum exposure. The patented BIO-Wheel 3-stage filtration system never needs replacing. A top-mounted motor filters all water through the high-performance, quick-change Eclipse Rite-Size filter cartridge and then to the BIO-Wheel at a rate of 150 gallons per hour, which results in 100% water-to-media contact, creating excellent water quality and a healthy environment for plants and fish. You’ll have unlimited and unhindered access to the entire aquarium. The specially selected fluorescent daylight bulb encourages healthy plant growth and enhances the colors of your fish without overheating the water or drawing a lot of electrical power. The leakproof acrylic tank is gently curved in front to offer you a 360-degree viewing panorama. The BIO-Wheel never clogs or breaks down. The safe, silent epoxy-sealed motor requires no maintenance or oiling. No loud air pumps, valves, tubes, or hoses are required. Plug the contoured light hood into any standard household outlet. A convenient front-access port allows easy feeding. 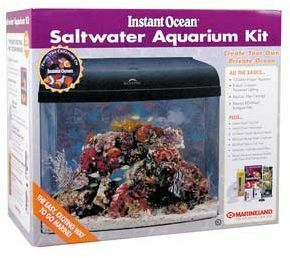 Premium fish food, tap water conditioner, and beginner’s fish-keeping guide are also included.